Wilhem Martens. Photo: G.I. Peters, Remember our Leaders, p. 170. Wilhelm Martens may have moved fifteen times in adult life, but he managed to serve as ordained preacher from 1919 to 1974, as Elder (Ältester) from 1931 to 1974, as a leader in the Conference of Mennonites in Alberta from 1931 to 1944, and as Reiseprediger (itinerant minister) in Alberta for many years. He helped organize a number of congregations: Chinook/Sedalia, in eastern Alberta, Coaldale and Vauxhall in southern Alberta, and he served Sardis and Chilliwack in British Columbia, and Niverville in Manitoba. Martens was born August 1892, in Landskrone, Molotschna, Taurida Province, in today's Ukraine. The youngest of seven children, he had elementary schooling in Landskrone, high school in Gnadenfeld, and pursued Teacher Training in Melitopol for two years. After teaching for three years he served in Kursk for several years as Sanitäter (medical orderly) before he was given an office job. After that mandatory service he took over a school in Blumenhof, Caucasus, 1,600 kms from Landskrone. There he met and married Sarah Dirks on 14 April 1919. His wedding on a Sunday morning was followed by his election to the ministry in the afternoon. His preaching career, beginning in August 1919, was combined with teaching and this activity continued through the years of famine that characterized the first years of the Bolschevik regime in Russia. Wilhelm and Sarah Martens immigrated to Canada in 1924 where they spent the first winter in Tofield, Alberta and the next spring and summer on a farm in Namaka, east of Calgary. Though he attended Mennonite Collegiate Institute, Gretna, Manitoba, in order to learn English and prepare for teaching in Canada, it is not clear that he ever took a school. During the early years of the Russländer migration, beginning in 1927, he found his calling in organizing congregations of Mennonites who adhered to the Kirchliche (General Conference). His first church was the Neukirchner Mennonite Church at Chinook/Sedalia where more than 40 Mennonite families had settled. He supported his family by farming a half section of land. In February 1929 at Didsbury he helped to bring widely scattered congregations in Alberta into the General Conference Mennonite conference. In 1931 he was ordained again as Elder by Ältester David Toews, Rosthern. 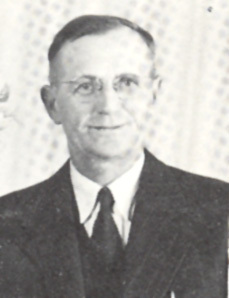 Wilhelm Martens served as chairman or vice-chairman of this Alberta Conference from 1931 to 1944. During this time he moved from Chinook in 1934 to the Coaldale Mennonite Church where he served until 1938. From there he moved to the Vauxhall to help organize a new congregation, the Vauxhall Mennonite Church. Though his ministry was characterized by frequent moves, he did justice to his eldership duties. For example, when the Chinook church dissolved, Martens officiated at the last wedding and performed the last baptism in that area in 1943 and 1944. In February 1946 he responded to a call from the First Mennonite Church Greendale in Sardis, British Columbia. He served there until 1950, also preaching part-time in the Chilliwack Mennonite Church and serving in the leadership of the Conference of United Mennonite Churches of British Columbia. In 1951 he returned to Vauxhall where his wife Sarah died unexpectedly in 1953, Martens retired for a short while to Rosemary where his two daughters Elsie (Mrs. John) Janzen and Agnes (Mrs. Peter) Janzen lived. But even there, as Elder, he preached in the churches at Rosemary, Gem, and Vauxhall on a part-time basis until 1956. His second marriage in 1956 to Helen Reimer, a widow living in Calgary, brought him to First Mennonite Church where he served as "lay minister." From Calgary, the Martens moved to Chilliwack, BC, where Helen became ill and passed away in 1959. In 1963, he married another widow, Katherine Kasdorf of Winnipeg and moved there. While in Winnipeg he was asked in 1965 to go to Chihuahua, Mexico, at age 73 to teach some classes in German. He and Katherine enjoyed the experience. The returned to Winnipeg where they lived between 1966 and 1969. After preaching in the church at Niverville, Manitoba from 1969 to 1974, they retired and moved to Winnipeg. As to Wilhelm Martens' personality, Ann Harder, Edmonton, formerly Vauxhall, described him as "a tireless, even restless man—always on the go and wherever he went, found a way to be useful." He seemed to be "more progressive than some of his peers—a man of action rather than philosophy." He had a "generous smile" which made him popular. "Never at a loss for words, he enjoyed meeting people, whether on the street, bus, or train, wherever." He passed away suddenly on 11 January 1976. Dyck, C. L. The Mennonite Conference of Alberta: A History of its Churches and Institutions. Edmonton, AB: Conference of Mennonites in Alberta, 1981. Harder, Ann. (Edmonton). Unpublished biographical sketch, based on her personal knowledge; an interview with Henry Martens, February, 2002; and information supplied by Elsie (Martens) Janzen, Rosemary, Alberta; Harder’s conference records were unidentified. Peters, G. I. Remember Our Leaders. Abbotsford, BC: Mennonite Historical Society of British Columbia, 1982. Penner, Peter. "Martens, Wilhelm Gerhard (1892-1976)." Global Anabaptist Mennonite Encyclopedia Online. 2006. Web. 21 Apr 2019. http://gameo.org/index.php?title=Martens,_Wilhelm_Gerhard_(1892-1976)&oldid=141211. Penner, Peter. (2006). Martens, Wilhelm Gerhard (1892-1976). Global Anabaptist Mennonite Encyclopedia Online. Retrieved 21 April 2019, from http://gameo.org/index.php?title=Martens,_Wilhelm_Gerhard_(1892-1976)&oldid=141211. This page was last modified on 20 November 2016, at 07:35.